THE GREAT DAM NEARING COMPLETION. This view from the Arizona side of the Colorado River shows the downstream face of the dam and the two intake towers on the Nevada side. Water passes down through these towers to the turbines in the generating station hundreds of feet below, or is allowed to escape into the river through twelve needle-valves below the dam. NO stream in the world has been so capricious, so devastating in its fury and its force, so unpredictable in its behaviour as the mighty Colorado River, which drains an area of nearly a quarter of a million square miles. The river’s now varies greatly; its floods are sudden and violent, and when it is low there is risk of failure of the water supply on which 75,000 people depend. 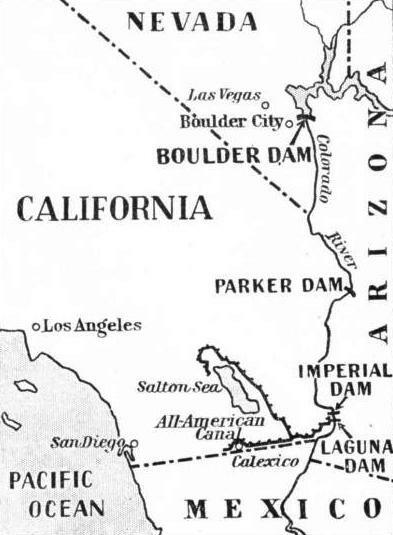 Within the river’s basin is the Imperial Valley, California, an area which, with its hot summers and mild winters, produces lettuce, peas, spinach, grapes, melons, citrus fruits and strawberries in vast quantities, and at seasons when there is no other similar source of supply in the United States. The problem of controlling the Colorado’s erratic flow has exercised men’s minds since the beginning of colonization ; but until recent years the magnitude of the task made it seem impossible. The Colorado (“Coloured”) River, so named because of the brilliant reddish colour imparted to its water by the silt brought down, was discovered in 1540 by the Spanish gold-seeking explorer Hernando de Alarcon; but the 1,700 miles of its length were not properly explored until the present century. Little use was made of the river, for it was too turbulent and too devastating, defying every effort of man to tame it. The Nile’s rise and fall, recorded systematically for over fifty centuries, are predictable and almost unvarying. This cannot be said of the Colorado, and fanning in its basin has always been pure speculation. At Yuma, Arizona, near the mouth of the river, the silt content recorded was equal to all the earth removed in digging the Panama Canal. This vast quantity of earth at Yuma had been brought down by the accumulated force of rain showers, melting snow and evening dews. All efforts at control were disastrous failures, and once, after works had been carried out with more optimism than forethought, the Imperial Valley was partly flooded. Nearly £1,500,000 were spent on various projects to protect the valley, the disposal of silt alone costing £350,000 a year. Obviously something had to be done. As early as 1902, Government and private engineers had selected Boulder Canyon and Black Canyon, Nevada, as possible sites for a dam, but it was not until 1919, when the possibility of developing water power on a paying basis made the colossal expenditure feasible, that the project gained serious national consideration. In 1920, Homer Hamlin, an engineer and geologist. drove a stake to mark what he considered the best dam site; and when the dam had been built, after new and independent surveys, the stake was discovered within a few feet of the spot chosen as the axis of the dam. In 1921 the Colorado River Commission was established, with representatives from the States of Arizona. California, Colorado, Nevada, New Mexico, Utah and Wyoming, under the chairmanship of Herbert Hoover, then Secretary of Commerce. Explorers, engineers and surveyors attacked the task anew, working on a river flowing at times with the speed of a railway train, and recording the topography of 100 miles of canyon with precipitous cliffs 1,000 feet high that had to be scaled. Beyond the canyon rim lay arid desert, scorched by fierce hot winds and blistering under a torrid sun in summer. Exploration was carried out chiefly by boat. and since in many places the walls of the gorge were sheer and it was impossible to land, immense and terrifying rapids had to be shot. Boats capsized, valuable gear was lost, and when a party camped at night on a rock shelf there was constant danger of a sudden flood, the river rising as much as a foot in an hour. In winter, the winds were bitter, and in the spring frequent gales swept across the desert. In summer the shade temperature reached 128° Fahrenheit. In December 1921 storms swept away the road connecting the camp to St. Thomas, Nevada, the nearest town for supplies; a spate destroyed a barge and drowned one of the drillers. In January 1922 a new camp was built, only to be levelled by a windstorm which swept away all the equipment, even to the floorboards of the tents. 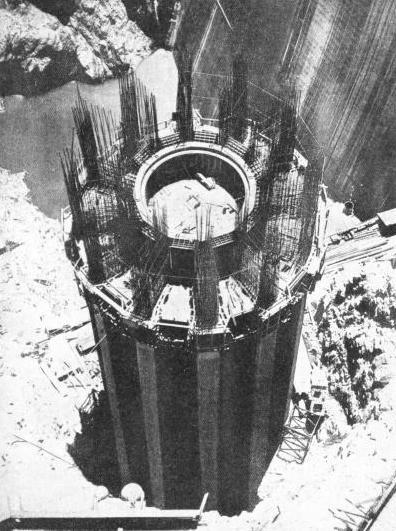 THE DOWNSTREAM FACE OF THE DAM, which was divided into a large number of vertical columns to facilitate the pouring of concrete. The vertical sections were staggered, gaps being left between them for cooling purposes. Built-in pipes and boiler-tubing then circulated water, which had been cooled by a special refrigeration plant. All the concrete was brought to the site on overhead cableways, from one of which this remarkable photograph was taken. In summer, rock and metal burned the hands of the workmen, and the walls of the gorge, reflecting the sun’s rays, created inside the canyon a steaming inferno. All measurements taken required temperature corrections; surveying instruments had to be shaded, and waves of hot air made readings impossible except. at short distances. Experimental drilling of the river bed was carried out from derricks in barges, each consisting of two pontoons. The barges were hung from cables spanning the waterway and were moved to the shore when the river rose in flood. Every phase of the work bristled with danger. Men had to be lowered down the cliffs on ropes, or they had to scale the sheer rock faces as best they could. Two men in a small boat were swept under a barge, but by a miracle both men and boat were rescued; a man fell from another barge, but luckily caught a rope and saved himself. When a night shift was leaving for camp, the motor of a power boat broke down, the boat was swept under a barge, and although three of the men managed to cling to the barge the fourth went under and vanished. Yet he was picked up alive, three hours later, on the Arizona side of the river by a boat. The holes bored were 200 feet apart and 200 feet deep. Fifty-eight men, working in four barges, were employed on this work. 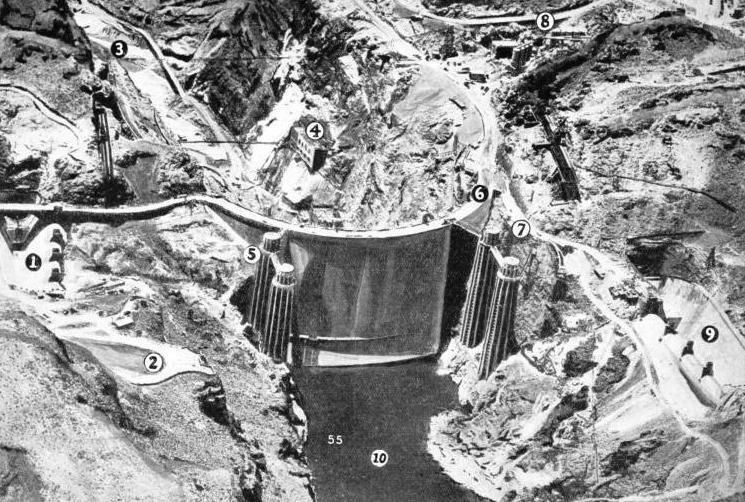 The final survey divided the Colorado River into three sections - the Upper Basin, including parts of Arizona, Colorado, New Mexico, Utah and Wyoming, where irrigation and water power could be developed in about equal proportions; the middle area of high-walled canyon, dropping 3,000 feet in 500 miles, suitable for power development alone; and the Lower Basin, of 69,000 square miles, eminently suitable for irrigation, and chiefly concerning the States of Arizona, California, Nevada, New Mexico and Utah. The site for the control dam had to be somewhere in the canyon region, and within reach of a market for the electricity to be generated, since this electricity was to pay for the entire cost of the scheme. Contracts were signed, with Los Angeles and other consuming authorities, that would guarantee in fifty years’ running a revenue more than equal to the initial outlay, the cost of running maintenance and the interest charges on the capital. The total outlay was to be about £40,000,000 and the contracts provided for a gross income of about £75,000,000 in fifty years. It was estimated that there would be an eventual net surplus of about £13,000,000. 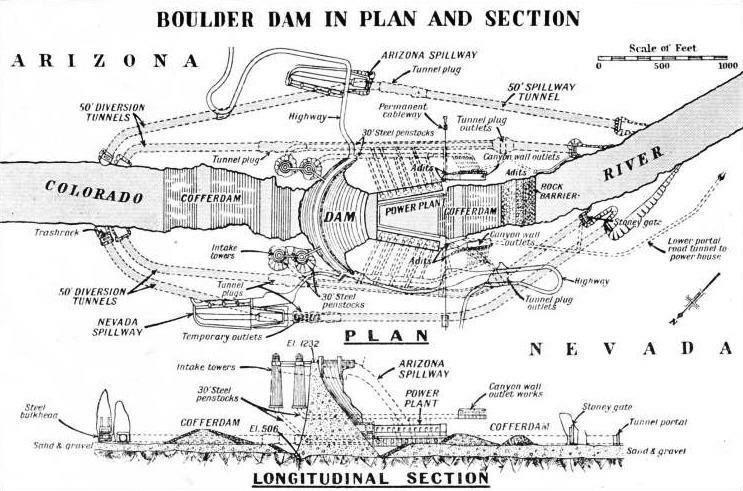 At first, the project was known as the Hoover Dam; later, when Boulder Canyon was tentatively selected as the site, the name was changed to Boulder Dam. Finally Black Canyon was preferred, as it was more accessible and narrower, with a shallower gorge below water level and with steeper walls, so that a dam of the same height would cost less and would have a slightly higher reservoir capacity than if Boulder Canyon had been chosen. The name, however, was not changed and the Boulder Dam was built in Black Canyon. The rock was easier to drill than that in Boulder Canyon, but was less pervious and was capable of standing better in tunnel excavations. No shoring was necessary throughout the many miles of immense tunnelling that were cut. Experimental drilling to 557 feet below water surface level did not penetrate any other formation of rock, so that the engineering problem was much simplified. The foundation rock is volcanic breccia or tuff, cemented into a tough durable mass well fitted to withstand weathering and erosion, and the district is free of volcanic action, which probably ceased thousands of years ago. In April 1931 a contract to build the dam and subsidiary works was awarded, and was signed by the Secretary of the Interior, Ray Lyman Wilbur, and by W. A. Bechtel, president of the new Six Companies Incorporated, which had been formed to tender. The price was about £10,000,000 - only £5,000 more than the cost estimated by the Government engineers and surveyors. The contractors were faced with one of the most stupendous engineering works ever undertaken. The canyon had to be plugged with concrete and a huge basin inundated. Tunnels had to be bored for spillways to carry overflow, to conduct a flow of water to the turbines. and to by-pass a certain amount of water while the hinterland was being flooded, as the water supply could not be cut off from the cultivated land downstream. The dam was to rise 727 feet above the river bed, to raise the water level by 584 feet, and to measure along its crest nearly a quarter of a mile. Below there was to be built a power house of steel and concrete. Meanwhile the mighty river had to be diverted. The plan of campaign was to build tunnels cut into the gorge above the dam and debouching below it; to divert the flow of the river into these tunnels by a cofferdam, and so to drain the bed where work was to be carried on; and then to build the dam and the power house for the new undertaking. The general superintendent of construction was Francis T. Crowe, a graduate of the University of Maine, who had joined the U.S. Bureau of Reclamations in 1904 and had resigned in 1925. ONE OF THE FOUR INTAKE TOWERS, each 390 feet high, through which water flows to the generating station. Each of these towers contains a pipe, 30 feet in diameter, which leads to four penstocks. Water may be allowed to flow past the penstocks and to escape into the river below, thus bypassing the power house; normally, however, the energy of the water is transformed into electrical energy by the turbo-generators. In 1931 he opened an office in Las Vegas, Nevada, thirty miles from the site, to recruit labour. He then visited the site and gave orders for work to begin. By June 700 men were at work. with three eight-hours shifts, a seven days week and no holidays, even through the heat of summer. Each item of the huge undertaking was in itself a task on colossal lines. The first and most pressing item was housing. In Superintendent Crowe’s words, “We must have a place to eat and sleep before we can put men out there.” So Boulder City was planned. The question of finding a suitable site presented difficulty. The surrounding country was arid sandy desert, supporting little but mesquite and cactus. At Black Canyon sheer walls of igneous rock rose 600 feet high, and the canyon in places was twelve miles wide from rim to rim. The canyon bottom was at that time inaccessible except by boat, and was uncomfortably hot. A location was selected seven miles away on the summit of the Divide, with fertile soil, an unimpeded sweep of winds from the four quarters, and inspiring views. It was 2,500 feet above sea-level, 1,700 feet above the river, and 1,250 feet above the top of the dam. Camp was pitched and work began at once on the city. Carpenters, living in tents, built shacks and bunkhouses on skids, for future easy moving, and in these houses plumbers, builders and other artisans were accommodated. The tent colony was watered by tank cars from Las Vegas, Nevada. The 300-acres town site was laid out by a well-known city planner, and was designed as a model town, with paved streets, sewers, electric lights, telephones, trees and lawns, flower gardens and a park. Many thousands had to be housed during the building of the town, and it had to be borne in mind that 1,500 men would afterwards be employed on operation and maintenance and that accommodation would have to be provided for large numbers of tourists. Through highways for fast traffic were kept apart from the residential and shopping streets, and alleys were laid out behind the buildings in the city centre, so that loading and unloading of trucks and vans would not cause congestion in the streets. Substantial buildings of brick, tile and stucco were put up, and in the residential quarter eight dormitories, two stories high, in the form of the letter H, with shower baths in the centre section, each housed 172 men. Individual cottages with two or three rooms were built and installed with electric lighting, flasks of high-pressure gas for cooking and fuel oil for heating. Larger houses of five or six rooms accommodated the officials, and two commodious houses were provided for Superintendent Crowe and for the company executives. Large general offices housed the executive, accounting, buying and engineering departments, and in the city centre were also a department store, warehouses and a garage. A machine shop was built to attend to all repairs, including those to railway engines and to the huge power shovels. THE GENERAL SCHEME OF OPERATIONS during the building of the dam may be easily followed by reference to the above diagrams. On the left are the tunnels through which the river (flowing from left to right) was diverted, and below their entrances is the temporary cofferdam. 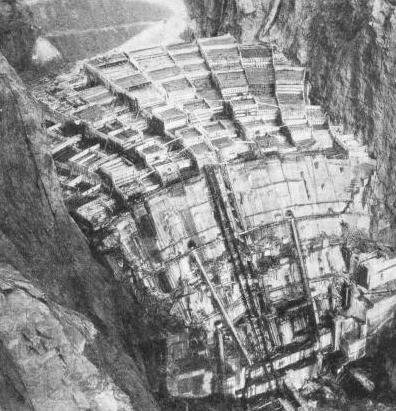 Between this and the dam proper are the intake towers, connected by penstocks (conduits) and adits (horizontal tunnels) to the turbines in the generating station, and to outlets in the canyon walls. Lower down the river are the second cofferdam and a rock barrier built to prevent the diverted water from flowing back and flooding the foundations of the dam. The spillways to cope with sudden floods are also shown. A modern hospital of brick, with £6,000 worth of equipment and thirty beds, and a recreation centre managed by a well-known heavy-weight boxer, were other features. Two large dining-halls resembling high-class restaurants seated 1,000 people, and in the kitchens there were ranges fired by electricity, by oil and by gas. The finest foods were served, with large and varied menus, and everybody from highest to lowest sat down to the same class of food. Six meals were served every day, to accommodate the various shifts, and workers carried a lunch which they selected themselves. A farm of 160 acres supplied 500 gallons of milk each day. All the main buildings were fitted with water-washed air-conditioning plants, air distributor systems for cooling or heating and electric water coolers. Water was pumped from the river, the sediment was removed, and the water was then purified, softened and stored in an enormous tank. As the Government controlled the entire area. the rules prohibiting gambling and the use of narcotics and alcohol were strictly enforced. Thus the model city differed from many mushroom growths in America by being peculiarly law-abiding. All this did not come about in a night and at first the vanguard of the workers had to endure great privations; but an excellent spirit prevailed, and work went with a swing from the start. The next problem was that of communications, and at first the site could be reached only by boat. The Union Pacific Railroad built a branch line from Las Vegas, on the Salt Lake City-Los Angeles line, to the site of Boulder City, and a highway and railroad were built thence to the top of the site. Transmission lines brought electric power to a sub-station built on a high rock platform in the gorge, and on June 25, 1932, power was turned on. The air compressors for excavation were packed in bits on mules, but proper roads were cut later. Suspension bridges were thrown across the gorge at several points, and cables carried power wherever it was required. Overhead cable-ways spanned the gorge. On the Canyon railroad two tunnels. either 1,000 feet long, had to be bored. This railroad rose from a height of from 720 feet, at the gorge, to 2,497 feet at Boulder City. In all, the railroads built at the dam carried a volume of freight greater than that of any main line, railroad in the West. The river was crossed by a wood pile and trestle bridge 1,140 feet long. The principal railroad jobs were moving excavated materials to disposal areas, bringing up sand, gravel and cement for concrete, and moving various building materials and apparatus to the power house. A matter of vital importance was the provision of sand and gravel for mixing the concrete, and for this purpose Bureau of Reclamations engineers searched the area, selecting at last a bed of alluvial material a few miles upstream from the site. All the sand and gravel required had to be moved before the water level rose and inundated the pits. Under the contract, the sand was to be “hard, dense, durable, uncoated, non-organic fragments . . . free from injurious amounts of dust, lumps, soft or flaky particles, shale, alkali, organic matter, loam, mica, or other deleterious substances.” The coarse aggregates were defined with equal exactness, and Government inspectors were always on the spot to see that these regulations were fulfilled. The plant installed produced up to 600 tons of raw aggregates an hour. THE MAIN FEATURES OF THE BOULDER DAM: (1) The Arizona spillway, over which water flows when the lake reaches its highest level. (2) A highway from Nevada to Kingman, Arizona. (3) The bed of the Colorado River below the dam. (4) Canyon wall outlet works. (5) and (7) The intake towers. (6) The highway, 45 feet wide, across the top of the dam. (8) Mixing towers where the concrete was prepared. 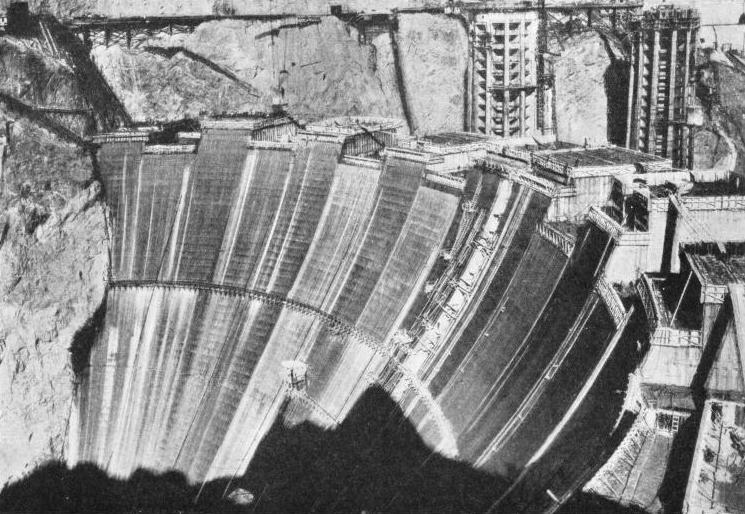 (9) Spillways on the Nevada side. (10) Boulder Lake, created by the building of the dam. The water from the river had to be pumped two miles, and cleaned to get rid of silt before use. The same water, constantly purified, was used again and again, with only slight additions from time to time. There were two concrete mixing plants, the chief one being situated 4,000 feet upstream on the Nevada side, where a shelf had been enlarged by blasting. No nearer site was available. The water here was also clarified before use, and the mixer automatically controlled the proportions of water, sand, gravel and cement to give concrete within 1 or 2 per cent of specification. The first major operation to be tackled was the driving of four diversion tunnels through the solid rock. These tunnels, of which there were two on either side of the river, were to carry the entire flow of the Colorado River round the site while excavations for the foundation were under way. With a diameter of 56 feet, the tunnels were to enter the precipitous cliffs about 2,000 feet upstream from the site of the dam, and to follow semicircular courses through the rock walls, emerging roughly the same distance downstream from the dam. Now that the dam has been completed, these tunnels have not been abandoned. Two of them are closed with concrete plugs, which carry valves for regulating the flow of the river below the dam. The other two, equipped with suitable structures at their upper ends, serve as spillways for overflow waters. A “bench”, 30 feet deep and 56 feet wide, was cut for the floors of the tunnels, which were horseshoe-shaped and 42 feet high. This shape was necessary to accommodate the huge electric shovels used for handling the “muck” or debris which had to be excavated. A drill carriage or “jumbo” was built to take twenty-four or thirty drills. This was capable of cutting half of the bench at a time, and was equipped with an apron of steel to protect the drillers from falling rock. This jumbo was mounted on a truck, which was backed up to the bench face, the jumbo being jacked into position and held firm while water, compressed air and light connexions were attached and the drills pointed. On the average, it took twenty minutes to get the jumbo into position ready for drilling, but as the crews became more expert this time was reduced by half. It took four hours to drill the bench and blast it, about seven hours to clear away the debris, and with slack time of under three hours it took only about fourteen hours for each “round”. When one half of the bench had been excavated, the jumbo was manoeuvred away and backed up against the other half, and the whole round was blasted at once. Little time was lost ; as the shafts were excellently ventilated, the vitiated air rose to the top, and the men could advance beneath it with the electric shovel and begin loading the debris on to trucks for disposal. The advance on each round was at first about fifteen feet; but this was increased, and later three rounds were sometimes completed in twenty-four hours. This work began in May 1931 and continued for more than a year. About 1,200 men were employed regularly, and for part of the time the numbers rose to 1,500. Altogether, 1,500,000 cubic yards of rock were removed. OVERHEAD CABLEWAYS were extensively used during the building of the dam, both for bringing material to the site and for transporting workmen to the great heights at which some of the operations were carried out. After the completion of the scheme, parties of visitors made use of these aerial railways to survey the dam and its surrounding works. An electrical circuit with locked safety switches outside the tunnels was used for detonating the charges, which were of gelatine dynamite. The electric shovels used a second circuit, and a third circuit was required for lighting, which was done by reflectors hung along the walls. Portable reflectors were used at the rock face. The steel of the drills was changed on each round, a special sharpening plant being installed. The rock through which the tunnels were drilled proved ideal, and the tunnels stood for their entire length without timber supports, no water being encountered on the way through the rock. The entrances of the tunnels upstream were protected by small temporary dams or barriers, to prevent water from pouring in, as they were almost on low-water level; but in February 1932 a sudden flood topped these embankments and flooded the tunnels. No serious damage was done, however, and several days later the water was pumped out, the accumulated slime and silt were removed, and work went on again. The tunnels had to be lined with 3 feet of concrete, which was poured in after the tunnels had been scoured of dirt and pebbles by compressed air and water. To begin with, concrete was laid for rails, wood placed on top, and the rails spiked to the wood, to carry a gantry crane. The concrete was then poured in sections 40 feet long. Its consistency was kept within narrow limits, the Bureau of Reclamations maintaining a laboratory and a large staff beside the mixing plant to carry out frequent tests. From two of the diversion tunnels spillway tunnels were cut back up-stream, to emerge at the level of the top of the dam. Thus these tunnels became a permanent part of the system, after having served their purpose of diverting the stream. 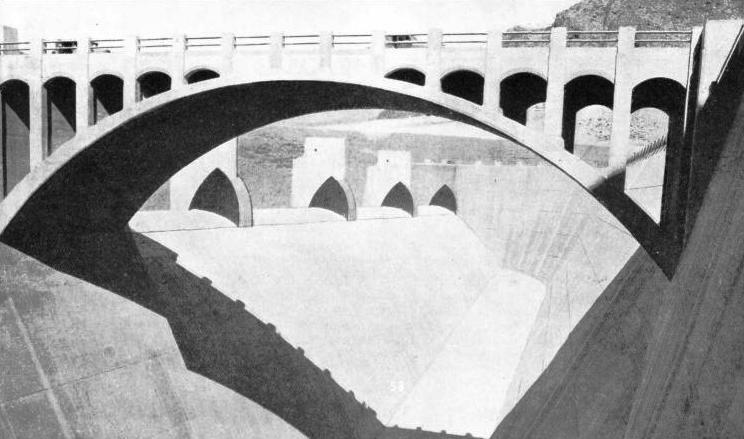 The third and fourth tunnels, on the Arizona side, were completed in November 1932, and the stream was diverted into them. Immediately a cofferdam had to be built, to block the flow to the site, and another cofferdam below the site, to prevent the river from “backing-up”, or reversing its flow and flooding the excavations. Trucks of rock were dumped from trestle bridges, as a temporary measure, and these rough dams were completed and serving for the time being within two days. Thereafter, work was expedited on the real cofferdams. 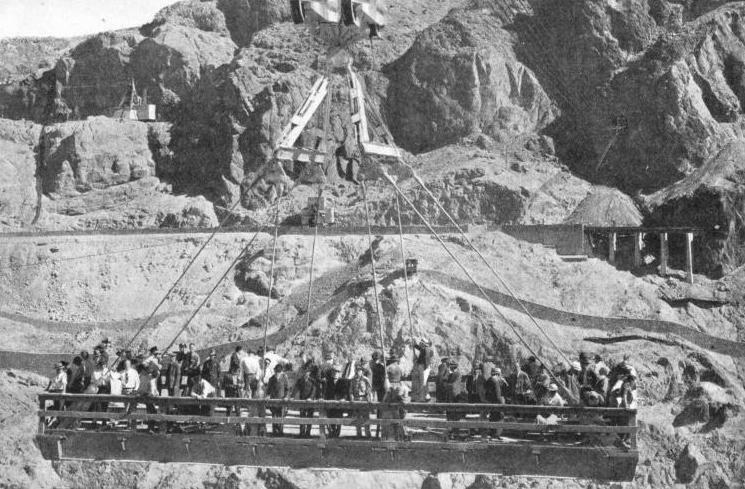 Various cableways were placed across the gorge to carry men and materials, and also for lowering equipment to the site of the dam. Four intake towers were built above the dam, with conduits, or penstocks, leading to the power house turbines. Outlets below the penstocks allowed the water to by-pass the turbines and to go direct into the output, shaft or tail-race. The two diversion tunnels nearer the river were to be brought into use here, plugged with concrete above and below the dam, with needle valves in the lower plugs; they served through the penstock pipes as outlets for regulating the flow of the river below the dam while the reservoir filled. More than two years would be needed to flood the area intended as a reservoir. and the water supply could not be cut off for that period. The additional tunnels were lined with steel pipe, and Babcock and Wilcox, who supplied the pipe, had to build a special fabricating plant on the spot, since such huge sections could not be transported over long distances by rail. As it was, the plant was a mile and a half from the site, and the pipe had to be transported by road. Every section of the 30-feet pipe was in two units, each 12 feet long and weighing 170 tons. For transportation a, special trailer was built, with four wheels on two axles at each corner, hydraulic steering and air-operated brakes. The, unloaded trailer, which was hauled by tractors, was designed for a maximum load of 200 tons. As the road was downhill all the way, braking was continuous, and the negotiation of bends in the road extremely hazardous and difficult. The building of the dam was comparatively easy. The site had been drained by the diversion tunnels and the cofferdams, and had been pumped dry. Silt to a depth of 50 feet. or more had to be removed, and this was all fresh sand and gravel, showing that the river was constantly scouring its bed. A sawn plank in excellent preservation was discovered on bedrock 40 feet below the surface, as proof of this. When the silt had been removed a deep channel was exposed down the middle of the canyon, and here the foundations of the dam were laid, 139 feet below water level. The, 3,400,000 cubic yards of concrete used for the dam raised new problems in constructional engineering. The dam had to be built in staggered sections, or columns with gaps left between them, to provide the maximum surface for cooling; but it was calculated that it would take about 200 years to build if cooling was left to Nature, so another method had to be used. Built-in pipes circulated cooling water and 800,000 linear feet of 2 in boiler tubing, embedded in the concrete, were used. The air compressors bought for drilling were designed to be easily converted into ammonia compressors for freezing, and thus a refrigeration plant was brought into use to cool the water to the required temperature. The concrete was brought to the site on cableways, whose towers could move upstream or downstream on runways on the gorge rim. THE SITE OF THE BOULDER DAM, on the boundary of Nevada and Arizona. The Colorado River flows southward below the dam for some 300 miles, and three other dams contribute to the irrigation of the country through which it flows. A 20-tons bucket dangled at the end of 650-feet fall lines from two carriages, and a signalman watched it as it approached. He had to gauge the exact time and place to stop the carriages on the cableway high overhead, so that the bucket would complete its swing immediately over the particular area in the block for which its load was destined. Then, as the bucket was momentarily stationary at the end of its swing, the signalman had to bring the carriages promptly into position to catch and arrest the pendulum action of the bucket. This done, the bucket was lowered to the surface, where two men released the safety catches with their shovels, guided the load to the exact spot, and ran clear as the signalman flashed word to the cableway operator to dump the load. The slightest miscalculation would have caused a serious accident; yet the work went on, day after day, without a break, and it, was uncanny to see the precision with which the machines, man-controlled, handled these great loads so easily and unerringly. The bucket was next closed and raised, the overhead carriages pulled towards the canyon wall, and the bucket began to swing and to gain speed. Again the signalman had to gauge to a nicety the exact amount of movement so that the pendulum action would carry the empty bucket directly above the car into which it was to be lowered, without crashing it against the rock face. Two concrete plants, known as “Lomix” and “Himix”, were used. and most of the men were, now removed to “Himix”, nearer the site of the dam. Men in rubber boots worked the cement, spreading it evenly, and other operations were carried out simultaneously - placing drain tiles, grout stops, cooling pipes, gallery forms. grout pipes for contraction joints, thermometers, strain meters and other instruments. Each block of concrete was examined by Board of Reclamations inspectors before being poured. Such springs as were discovered were piped to the surface of the dam, and the cooling pipes and contraction joints were finally filled with grout under high pressure. The last job of all was the building of the power house, designed to generate electrical energy to the amount. of 4,330,000,000 kilowatt-hours, equivalent to a quarter of the total United Kingdom consumption in 1933. There are fifteen 115,000 horse-power, and two smaller generators. The dimensions of the reservoir are impressive. It extends for 115 miles upstream from the dam, and already evaporation from this huge surface has beneficially affected the climate of a great tract of the surrounding country. The reservoir serves, also, as a sediment tank. and the water clarifies as the silt settles; but if is calculated that after fifty years more than three-quarters of the reservoir capacity will still be available. One striking effect of the settlement of silt is to cleanse the river water, so that in time, with most of the silt precipitated in the reservoir, the lower Colorado will become a clear stream, belying its name. The reservoir is now a great sheet of clear water, an inland sea spreading, blue-tinted, over the desert. On February 16, 1936, the final stage in the Boulder Dam project was inaugurated when Francis Crowe brought down a gate to close the last diversion tunnel; and the work was finished in four and a half years, no fewer than two and a half years ahead of schedule. This was accomplished with the use of colossal machinery; but the credit for it must be shared by the 6,000 men who toiled day after day for four and a half years without a holiday, facing danger and hardships at their work with a sardonic humour which revealed itself in innumerable flashes. The largest of the immense travelling cranes was affectionately known as the Flying Trapeze. A wag painted up a legend over the Powder House door - “God Bless our Home!” Nobody left the work and nobody was dismissed, once the project was under way. If, as it was said, a man was killed for every £100,000 spent, courage remained high, a courage in which is embodied the modern spirit of the old pioneers. The task was completed. It stands, a vast monument to man’s ability to subdue nature; but few of the throngs of tourists - they average over 30,000 a month - are likely to grasp all that this monument has meant, or the immense possibilities it opens up for future conquests. THE ARIZONA SPILLWAY, which, with a similar channel on the other side of the river, protects the dam from the effects of a sudden rise in the river. The two channels can by-pass 400,000 cubic feet of water a second, nearly twice the volume of the greatest known flood on the Colorado River. The bridge in the foreground carries one of the new motor highways.